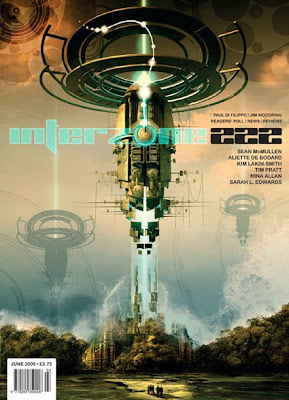 There’s a whimsical air to this edition of ‘Interzone’, the stories have a more fairy-tale feel than usual and there’s a distinct absence of hard sci-fi. This feeling arises from Adam Tredowski’s cover onwards, where a small crowd watches on as a magnificent structure is assembled from the sky. Inside there’s an enjoyable interview with Paul DiFilippo and Jim Woodring, along with the usual collection of reviews and news. So, what of the fiction?